With over 50 years of experience in the body shop industry, the Spinelli group offers you a brand-new body shop at the cutting edge of technology. 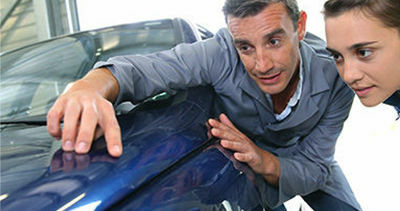 Our body shop experts and master painters are trained to repair and restore the damaged parts of your vehicle’s body. We feature a highly developed servicing area where repairs are carried out by qualified personnel, a parts department offering a multitude of genuine parts as well as on-site car rental. The Spinelli body shop is a multi-service centre offering everything you need in one convenient location. To learn more about the range of services offered by Spinelli body shop, make an appointment with us online by filling out a contact form through our website. In addition, in the event of an emergency, we offer a toll-free service line at 1 844 725-3440, available 24 hours a day, 7 days a week, and a replacement vehicle for every customer.